Never too old to dance! BookEnds is a 6 minute dance choreographed by Susan Jordan and performed by SeniorsDANCE Company. 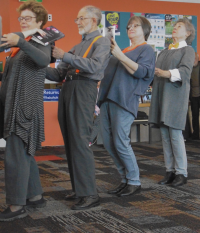 The work celebrates reading books and the fact that one is never too old to dance. Average age of performers is 76 with two in their 80’s. Performances are during NZ Dance Week in Auckland pop-up locations. SeniorsDANCE Company often performs in Auckland and is a development from the SeniorsDANCE classes that have been going for a number of years. Most of the performers have only started dancing in their senior years and and remembering the choreography a real challenge. It’s all part of the concept of “creative ageing” - participating in creative activities to keep the body and mind alert and responsive. The performance on 4 May at Avondale Library will be followed by a demonstration class for everyone, young and old, to practice. Original generation time 1.5898 seconds.